I hope you all have your fabric and are ready to start piecing! Before you do anything else, take your 3/4 metre length that includes your binding fabric and cut four 2.25 or 2.5 inch wide (whatever you prefer) width-of-fabric strips. Put these away for later. I can neither confirm nor deny that I may have had to buy extra black the first time because I forgot to do this. Ahem. 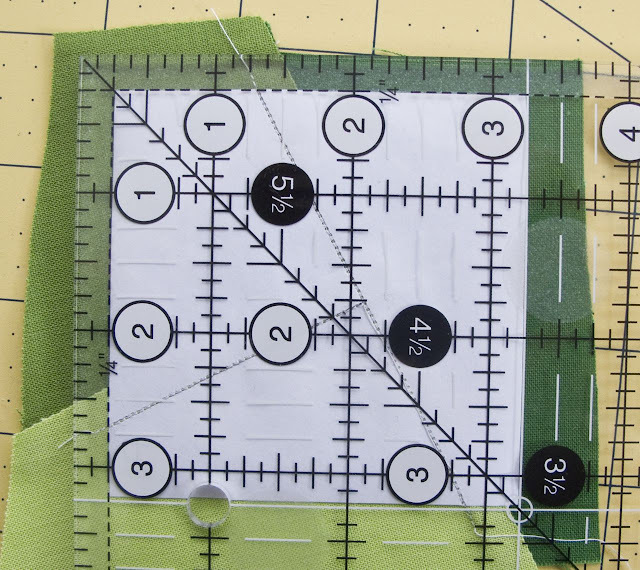 If you are new to foundation paper piecing, then please check out this tutorial for a brilliant, clear set of instructions that are far better than I could manage! 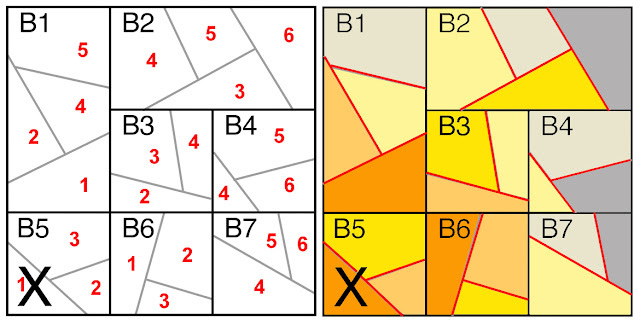 Here are the suggested colour layouts for block A and B. To make things a little easier for those of you using your own colour schemes I have included a colour by numbers version as well – simply number your fabrics from 1 to 10, starting in the middle. I hope it makes sense! I find it really helpful to cut all my fabric before I start piecing so that it’s all ready to go. Place the whole template on the fabric and eyeball where to cut, leaving a generous half inch around all sides to allow for extra wiggle room (and less swearing). It can be tricky sometimes to decide what order to sew the pieces, so here are a couple of examples. As a general rule try to ensure that the seam allowance ends up under the darker of the two colours you have just joined so that it doesn’t show through to the front. 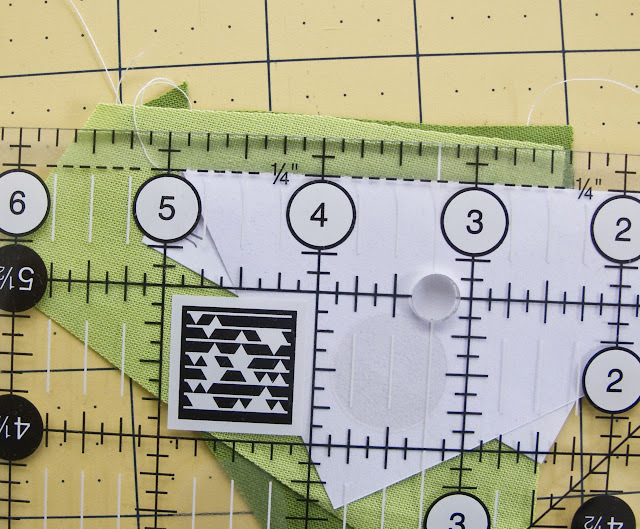 Remember to shorten your stitch length to make it easier when it comes to removing the paper, and trim each seam allowance to 1/4 inch before sewing the next seam. 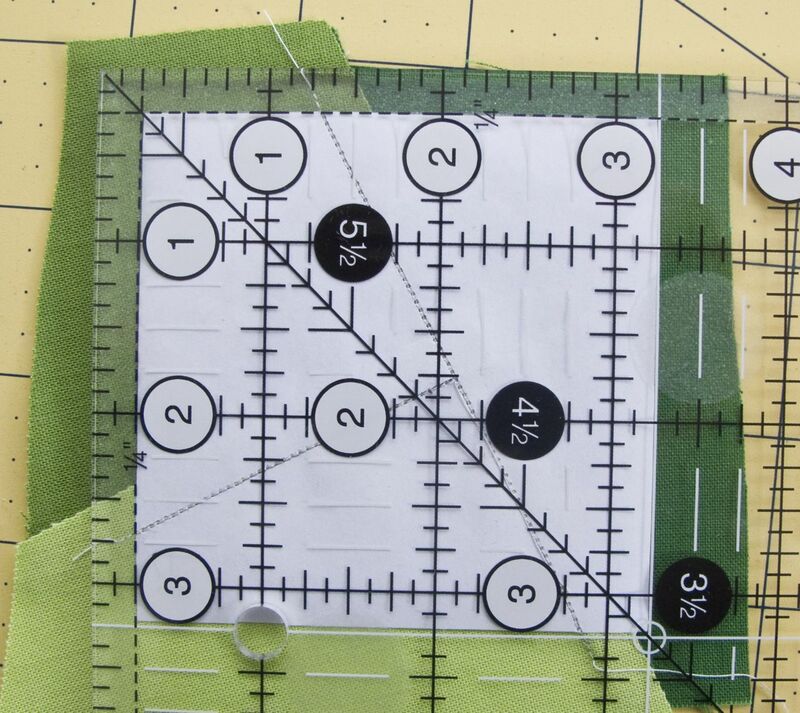 Once you have stitched all the pieces in each block sew them together and press the seams open to minimise bulk. Pin carefully (you will have some bias edges that will probably go wibbly otherwise) and use the edge of the fabric rather than the paper as a sewing guide. This is because there are so few seams in the paper that it moves around quite a lot. See how I have actually stitched over the paper in the seam below. If I had used the paper as a guide then my block would be all wonky. 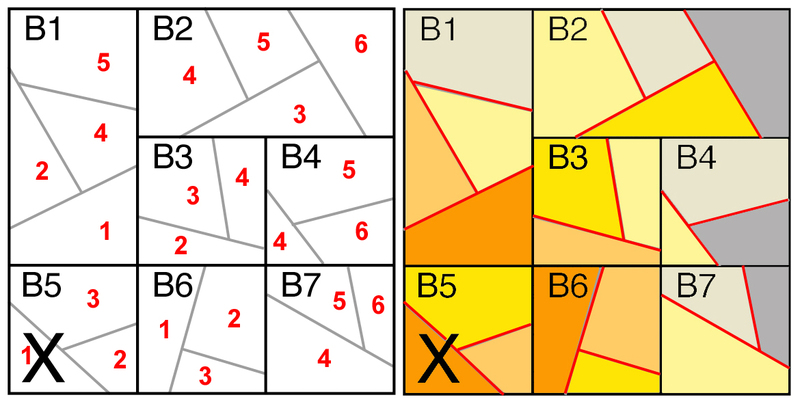 Because of the nature of foundation piecing, each block when finished will be a mirror image of the original layout. This confused the hell out of me the first time around (I’m not necessarily the sharpest tool in the box). 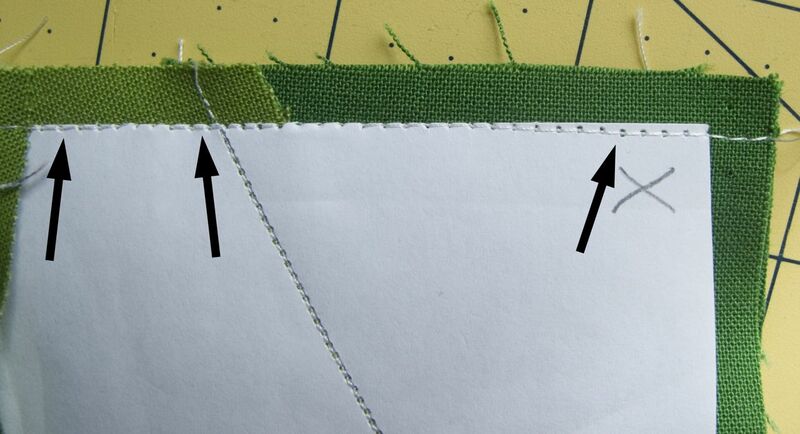 If possible, keep the paper intact until you have sewn the top together so that you can check the layout is correct. 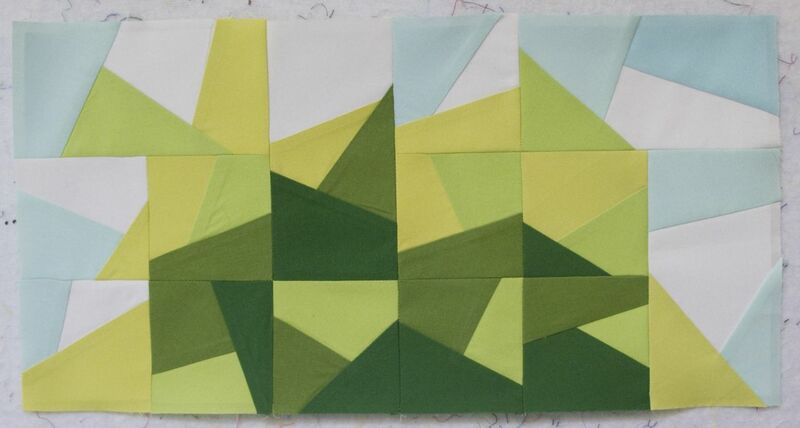 And here are my block A and B all sewn together. I can’t wait to see how yours turn out! I hope this all makes sense. Please let me know if you have any questions, either here or in the flickr group.